Although linguists have argued that certain patterns of language organization are the exclusive province of humansÑperhaps the only uniquely human component of languageÑresearchers from Chicago and the University of California, San Diego, have discovered the same capacity to recognize such patterns and distinguish between them in Sturnus vulgaris, the common European starling. In the Thursday, April 27 issue of Nature, the researchers show that these starlingsÑlong known as virtuoso songbirds and expert mimicsÑcan be trained to discriminate between two different patterns of organizing the sounds they use to communicate. Following the lead of language theorist Noam Chomsky, linguists have held that this recursive center-embedding is a universal feature of human language and, moreover, that the ability to process it forms a unique computational ability important for human language. One previous study, however, suggested that even non-human primates are incapable of recognizing anything beyond the simplest syntax. A paper published in Science in 2004 by scientists at Harvard and MIT found that cotton-top tamarin monkeys were not able to master higher-level grammar patterns. The authors noted that vocal learners, such as songbirds, might have produced different results. Nusbaum, Margoliash and psychologist Kimberly Fenn had previously collaborated on studies of the role of sleep in speech perceptual learning. Gentner, a neuropsychologist, expert on starlings and, at the time, a postdoctoral fellow at Chicago, was an essential addition. To assess the birds’ syntactical skills, the research team exploited the diverse sounds in starling songs. They recorded eight different ‘rattles’ and eight ‘warbles’ from a single male starling and combined them to construct a total of 16 artificial songs. These songs followed two different grammars, or patterning rules. Eight songs followed the “finite-state” rule, the simplest sort, thought to account for all non-human communication. A finite-state grammar allows for sounds to be appended only at the beginning or end of a string. These songs were built up from a rattle-warble base by adding rattle-warble pairs at the end. The simplest song was one rattle followed by one warble. The next simplest, a rattle, then a warble, followed by a different rattle and warble. The other eight songs followed the “context-free” rule, which allows for sounds to be inserted in the middle of an acoustic string, the simplest form of recursive center-embedding. So a context-free sequence also began with a rattle-warble base but built up by inserting new sounds in the middle, such as rattle-rattle-warble-warble. Eleven adult birds were given lessons on distinguishing between these two sets of songs using classic reinforcement techniques. The birds were rewarded with food when they heard a song from the context-free set and for refraining when they heard one from the finite-state set. 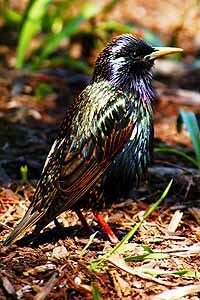 After 10,000 to 50,000 trials over several months, 9 of 11 tested starlings learned to distinguish the patterns. The birds were not simply memorizing particular sequences of rattles and warbles. They could distinguish between different patterns even when presented with entirely new sequences of rattles and warbles. They were applying rules to solve the task. The researchers also checked to see how the birds responded to “ungrammatical” strings, songs that violated the established rules. The starlings treated these differently, as expected if they had learned the patterns. The experimenters then asked if the birds were capable of a key feature of human grammars. Could the starlings extrapolate these patterning rules to distinguish among longer strings? Remarkably, after learning the patterns with shorter songs made up of two pairs of rattles and warbles, the birds were able to recognize strings containing 6-to-8 song elements. The finding that starlings can grasp these grammatical rules shows that other animals share basic levels of pattern recognition with humans. “There might not be a single property or processing capacity,” the authors write, “that marks the many ways in which the complexity and detail of human language differs from non-human communication systems. But these iridescent six-inch, three-ounce singing black birds have known this all their lives. They were only waiting for this moment to arise.